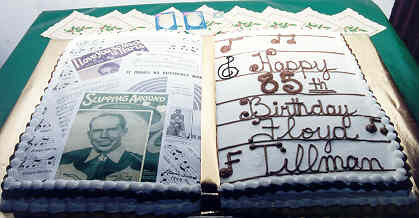 Floyd Tillman celebrated his 85th Birthday in Llano, Texas, on December 16, 1999. The celebration was sponsored by the Heart of Texas Country Music Association in Brady, and the Llano Country Opry. Over 400 attended the special celebration along with special guests including Willie Nelson, Frankie Miller, Johnny Bush, Al Dean, Jimmy Eaves, Justin Trevino, Johnny Gimble and the Llano Country Opry Band. Floyd was totally surprised by the party and espcially by his old friend Willie Nelson's appearance. A musical medley of Floyd Tillman songs were sung by several of those attending including Justin Trevino, Sammy Geistweidt, Kelsey Behrens and Willie Nelson. Floyd then performed all of his classic hits in a forty five minute set. Floyd delivered "Slippin Around" "I Love You So Much It Hurts Me" "Each Night At Nine" "Small Little Town" "I'll Take What I Can Get" and many more. It was a great night that will long be remembered.